Notes and quotes from the Hokies ahead of their game against East Carolina bye week. Deletes everything written through Tuesday. The Hokies aren't playing football this weekend. If you hadn't heard that, I really, really hope you don't live anywhere near Hurricane Florence's path. The Hokies will take advantage of this extra bye week before travelling to take on Old Dominion next Saturday in Norfolk. Supposedly. With that said, welcome to the Hurricane Florence Edition of Four Down Friday. What follows is a mass of player and coach insight from Virginia Tech's two media opportunities this week. The impending rain facilitated a healthy conversation about protecting the ball. With the Hokies still planning to play the game at that point, it made sense. After a pair of first downs on the opening drive against William & Mary, Deshawn McClease put the ball on the ground and consequently spent time on the bench. Right out of the gate on Tuesday, McClease was asked for his perspective on the situation. "Coach made it clear early on. Yeah, I already knew what was coming [time on the bench]. ... Rule number one is just 'don't fumble the ball'. We can't turn over the ball. Ball security is number one. I already knew what the outcome [the benching] was going to be. I knew that I also couldn't hold on to it so long, because I knew I was going to get back in the game. I knew I couldn't hold on to it because it would bring you down. I would have to just let it go at the end of the day. Afterwords, Sunday's practice, I overemphasized ball security, carrying the ball higher." "We definitely do wet ball drills. It's just always been the same. We just don't turn the ball over. We go about our day like we usually do. 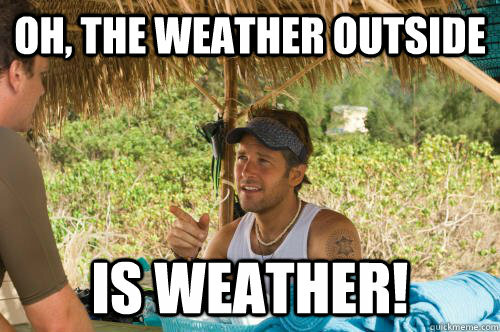 We can't really do much about the rain. We can't control that." "Wet ball [drills] are no gloves on, quarterbacks are throwing you the ball. You're catching and tucking and finishing through." Under Fuente, the Hokies played in two downpours — the 34-3 win over North Carolina in 2016 and the 24-3 victory over Duke in 2017. 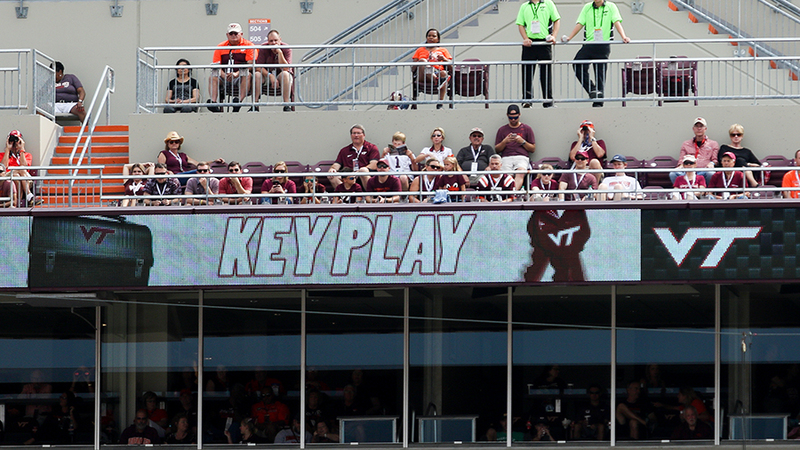 Virginia Tech fumbled twice among those two contests. The Blue Devils and Tar Heels combined for three fumbles. A seemingly non-stop parade of bad snaps was a main storyline of the 62-17 win over the Tribe. Zachariah Hoyt started at center both games this season, but the redshirt sophomore struggled reliably snapping the ball against William & Mary. Eventually, six-year veteran Kyle Chung gave Hoyt a breather. Chung, Hoyt and true freshman John Harris rotated the rest of the game. There was even one instance where Chung was on the sideline, Hoyt sent the ball sailing, and Chung immediately started to jog out to replace Hoyt. "Well, it is a concern always. But I'm fortunate I have some guys there that the only thing they know is how to work. Especially with Hoyt and Chung and John Harris, [Braxton] Pfaff, all of them take snaps every day. So something obviously we'll work on. If the weather is the weather, we'll handle that as it comes also. We'll definitely prepare for it starting today." What stood out there is Vice has at least four different offensive linemen repping at center. He later expounded upon it. "They've been taking equal reps throughout. It's sort of a day to day competition. Hoyt's played guard too. But nobody has seen him do that, except me probably. Anytime I can find a guy that can snap, I'm letting him snap everyday. Cause those guys are valuable. Especially somebody like Kyle, who I think, in the first quarter the other day played center, guard and tackle." "I mean, I just tell Hoyt to, you know, worry about the next play. You can't really go back in time and re-snap the ball. So just worry about the next play and get better from there. Get snaps after practice, things like that. "It's vital for any offensive line to have more than one player play multiple positions, so we're glad to have Chung be able to do that." Third Down: Redshirt Freshman. You'll Never Believe Who Fuente Has Picked! The NCAA amended the redshirt rule in the offseason to allow a player to play in up to four games without burning a year of eligibility. The change garnered virtually no negative feedback from anybody across the country. It allows coaches to evaluate depth and improve young players in real game situations. The Hokies have taken full advantage of this rule, playing 12 true freshman so far this season. Dax Hollifield, Tre Turner, Christian Darisaw, Keshon Artis, John Harris, and James Mitchell are a few. Four-star 2018 QB signee Quincy Patterson was scheduled to be the 13th true freshman to participate in the William & Mary game. That was before the Tribe went on that 16-play, 9:50 drive in the second half. "I just didn't want to put him out there that late, kind of just the way unfolded," said Fuente after the game on Saturday. "They held the ball a long time on that one drive and a really good opportunity never really came about for us to put him in, but it's something we talked about." And so the Patterson hype train goes another week without leaving the station. "Well I have a spreadsheet, it's got all the true freshman on there. It's got a little x next to the, you know, we've got several that haven't played, several that have played one game, and a whole bunch that have played two. Keeping track of that, as we go through it, I'm not going to tell you which guys, but there's a guy or two that maybe have played that we feel comfortable that we would like to try and redshirt. There's guys that are going to play throughout the season. We know that now. I still say that it's something that we're going to have to look at every single week. Just making definitive statements about it, right now, I think it just really difficult. We just don't know what it going to happen. Those things can change so quickly. Your depth can change with one snap of the ball. Then all of a sudden you start to look at this a little bit differently. We're keeping track of it. It's something we talk about every single week. On sunday, for example, I sat down and went through them all. Talked about each of those guys, how we feel about them, what we're thinking about doing." Emphasis added by me. The coaching staff seems to know already a couple might end up redshirting this year. Fuente touched on the fact that it could all change on a dime, but I think it's promising to hear that the coaching staff has some semblance of an idea after just two games. This was the first time Hill was made available to the media since a Twitter spat over the summer with Andy Bitter. Coincidentally enough, those tweets have been scourged from the internet. So, no embed from me. And wouldn't you know it, Bitter led off with a question. There didn't seem to be any hurt feelings though. Hill gave some great, albeit short, insight about his role in Bud Foster's defense. "Just relying on my technique and knowing how to play any defense. Just knowing all the plays and where I need to be aligned. That's what I tell these younger guys. Once you know that, you'll be able to play fast, be able to play like you're a kid, just go out there and have fun." "I think this year's scheme, it helps me be more free and play like I was a kid. Like I was 10 years old again. Bud just wants me to go free now. Everything is working out as planned." "The biggest thing I was worried about was our chemistry this year, knowing that we had a couple guys missing. But these guys have worked their tails off and to be a part of this defense, and if you're a starter, then you're a starter. And if you're a second-team person, you've got to act like a starter too. It's just inspiring to see these young guys take in, and buy into the team." "Honestly, the defense is basically the same. Nothing really has changed. He [Foster] might have opened a few things up for the d-ends more instead of the linebackers. Overall, it's Bud's defense. Whatever he calls is going to work regardless. " "I'm trying to be vocal. Right now I'm leading by example. Just learning from guys like Slick [Ricky Walker], Josh [Jackson], some of these guys who are more vocal that have been vocal. Just watching them and see how they do things vocally, because I've always been a 'lead by example guy'. Just being mature, being a fourth-year guy, even though I redshirted and I'm a junior, but just the maturity and you got to bring these younger guys up, because at the end of the day they're next up. You've got to pass the baton to them. You want this tradition to be carried on very well." "I planned on getting to about 260, but I got close to that weight, and I really didn't like that weight that I was at. So I ended up losing 15 pounds of body fat and gained 16 pounds of muscle." Nice write up. Interesting to see how this new redshirt rule plays out. hopefully several more blowouts are in the near future so QP gets some life in game snaps! Good writeup. Anyone else get the feeling Hill views this as his last year? A little, but some of that might just be the fact that he's in a leadership position now, so he's talking about the "young guys" a whole lot more. Not really from this interview. Just seems like he is embracing the role of upperclassman / veteran leader. Not sure QP is on the travel squad (as he wasn't in Tallahasse) so may have to wait until the unc game. Is there a NCAA travel roster limit or just an ACC limit? Each conference sets their own limit. I'm not sure if it's just for conference games or if it's for all games. I'd imagine that bowl games are exempt as well. Curious if this has been (or will be) altered with the new red shirt rules. Gotta say, it's one thing to hear the coaches rave about how talented the new players are and how they've bought in, but I think it says a lot more when the veterans on the team are obviously excited about the future of the program like Hill clearly is. -why yes, yes it is... how did you know? Andy was asked in the mailbag about QP getting time and it seems like he glossed over or completely missed that ODU is terrible. (edited: fake news) I keep forgetting we play them myself what with the Duke game and ND coming up (five games scheduled in September!). I think it's because it's a road game. And QP didn't travel to FSU and will probably not travel to ODU. Most teams don't travel 4 QBs and I think that there are limits on how many people can travel. And I will now drink. Happy Friday! You're right, he did mention that. I forgot. You're right, there are limits on the travel roster size and those limits are determined by the conferences. I am assuming that the the current limit for the ACC is 72 players as the most recent document I can find is from 2012/2013 which says that the travel roster was set at 72 players in May 2009 (see section Article VIII. FOOTBALL). I don't know about you guys, but I'm just glad we get a bye week to help prepare for ODU. They are historically bad against P5 teams with extra time to prepare. FTFY. Based on last nights game, they are historically bad. "So I ended up losing 15 pounds of body fat and gained 16 pounds of muscle." "But first...you gotta get speed. Demon speed. Speed's what we need. We need greasy, fast, speed!" Haha that was my reaction too. I wish I could easily do that. I am the heartbeat of Blacksburg. A fortress built out of stone but made with champions. Give me six months of Hilgart, Tech's dining facilities, workout facilities, and nutrition staff and I'm sure my results would be quite impressive as well. How come that isn't available for silent auction? It is, a walk on student athlete. Lol except the average fan would probably go all Cam Goode in about 30 minutes. I'm not asking for a spot in the team workout smoke sessions (had enough of those in the Corps of Cadets, thanks). But an individualized workout/diet routine? Hell yeah. I don't need to be game-ready, let's just say I've got a bit more than 15 lbs of fat to lose. If I'm not mistaken there was either a secession with Hilgart or the nutritional staff the last auction. Secession you say? That didn't go over so well last time. Great read! I'm really excited to hear Trevon Hill's comments for the first time in ages, he's my favorite Hokie after he nearly caught Cam Akers on his long run...big man has some serious wheels. overall, it's Bud's defense. Whatever he calls is going to work regardless. " Vice: If the weather is the weather, we'll handle that as it comes also. "You're doing too much, do less." Thank you for actual football news. It was beginning to feel more like the offseason than a forced bye week.